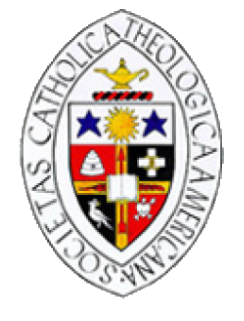 This association shall be known as THE CATHOLIC THEOLOGICAL SOCIETY OF AMERICA. Its purpose, within the context of the Roman Catholic tradition, shall be to promote studies and research in theology, to relate theological science to current problems, and to foster a more effective theological education, by providing a forum for an exchange of views among theologians and with scholars in other disciplines. In this way the Society seeks to assist those entrusted with a teaching ministry of the Church to develop in the Christian people a more mature understanding of their faith, and to further the cause of unity among all people through a better appreciation of the role of religious faith in the life of human beings and society. 1. Membership in the Society shall be either active, associative, or honorary. Active membership is open to those who possess the doctoral degree in theological or related studies, and who are or who have been actively engaged in teaching or research in the sacred sciences. In exceptional cases the Committee on Admissions may recommend for active membership those whose education and scholarly achievements could be considered as meeting the standards customarily demanded for the doctorate. Associate membership is open to those who have completed at least the course requirements for the doctoral degree in theology or religious studies. Honorary membership is conferred, upon a recommendation of the Board of Directors, by vote of the active membership present at the annual business meeting in recognition of special services of the Society. 2. Candidates for membership, upon recommendation of the Committee on Admissions, are admitted to active and associative membership in the Society by the vote of the active members present at the annual business meeting. 3. The annual dues for all members shall be determined by the Board of Directors and are payable in advance on January 1st of each year. The fiscal year of the Society shall end on the 31st of December of each year. 4. The dues of new members shall begin with the year of enrollment. 5. Membership is presumed to be continuous. Nonpayment of dues for a period of three years will be considered as equivalent to resignation from the Society. 6. Nothing in this article shall be construed in such a manner as to exclude anyone admitted to the Society before adoption of this Constitution. 1. The officers shall consist of a President, a President-elect, a Vice President, a Secretary, and a Treasurer. This shall be the order of succession of officers in the case of absence or disability. 2. The Board of Directors shall consist of the officers of the Society- namely the President, President-elect, Vice President, Secretary, and Treasurer- and five (5) other Directors elected as provided in Section 3 of this Article. 3. Elections and voting in general shall be governed by the following provisions. Active members alone shall be eligible to vote and to hold office. Election to office shall be by a simple majority vote of those present at the annual business meeting. The officers shall be elected for a term of one year. The President-elect shall automatically succeed to the presidency. The Vice President shall automatically succeed to the presidency-elect. The retiring President shall automatically become a member of the Board of Directors for a one-year term. Annually two other members shall be elected to the Board of Directors for a term of two years. In the event that the Vice President or the President- elect, or retiring President are unable or unwilling to succeed to the offices indicated above, another member shall be elected in their stead. If any vacancy shall occur among the Directors, by reason of death, resignation accepted by the Board, or otherwise, such vacancy may be filled by two-thirds majority vote of the remaining Directors. Any such vacancy may also be filled by a majority vote of the active members of any business meeting of the Society. 1. The regular meeting of the Society shall be held each year at a time and place to be designated by the Board of Directors. 2. Special meetings of the Society may be called by the Board of Directors. Upon the written petition of one-fourth of the total active membership, a special meeting of the Society shall be called by the President. Notice of a special meeting shall be mailed by the Secretary to the active membership at least fifteen (15) days in advance. 3. At the business meetings of the Society the active members present shall constitute a quorum. 1. The President shall annually appoint a Committee on Nominations which shall consist of three (3) members. This committee shall make nominations for all the elective officers of the Society as provided for in the Constitution and By-Laws. 2. The President shall appoint a Committee on Admissions to consist of five (5) members of the Society who are not members of the Board of Directors, except the Secretary of the Society, who shall be ex officio member of this committee. This committee shall examine the credentials of those applying for active and associative membership and recommend those who qualify to the vote of the membership at the annual business meeting. 3. The President, with the approval of the Board of Directors, shall appoint annually a special-Award committee to select the recipient of the John Courtney Murray Award for Distinguished Achievement in Theology. 4. The President shall appoint such committees as the general welfare of the Society demands. These committees, with the exception of the Committee on Nominations, shall be at all times responsible to the Board of Directors. This Constitution may be amended at any business meeting of the Society by a two-thirds affirmative vote of the active members present. Notice of such proposed amendment, with copy thereof, shall be mailed to the entire active membership of the Society not less than one month in advance of such meeting.